online or offline on or before 12-02-2018. Online application will be accepted through www.nmdc.co.in official website of NMDC. Candidates selection for this NMDC recruitment of Maintenance Assistant Trainee will be through Written test and Trade Test. 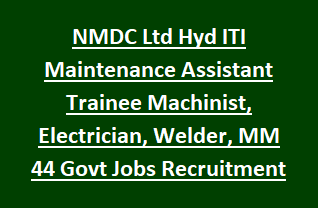 Candidates who qualified ITI in Machinist/Welding/ Motor Mechanic/ Auto Electrician /Diesel Mechanic they are only eligible for applying this NMDC Recruitment of Maintenance Assistant Trainee Jobs. It is mandatory to send the application form copy to NMDC before 12-02-2018 along with all necessary documents. More information about this NMDC Maintenance Assistant Vacancy qualification, salary, age limits, Exam pattern and syllabus are given below. There are 44 ITI Mechanical/Welder/Electrician jobs in this NMDC ltd recruitment notification 2018. Candidates must have qualified ITI in Diesel Mechanic or Motor Mechanic or Auto Electrician or Machinist or Welding. As on 01-06-2014 upper age limit is 30 years for general candidates. Age relaxations are applicable for reserved persons. On regularization candidates will received the monthly salary of Rs.11300-3%-20000. Training period stipend is Rs.11000/- per month. Candidates selection will be through Written exam and Trade Test. Written exam will be conducted for 100 marks. Written exam will objective type OMR based consist of 3 subjects. Candidates must have secured good score to get shortlisted for Trade Test. Trade Test will be only qualifying nature. Candidates who are interested in this NMDC recruitment they can apply either online or offline. It is mandatory to send the filled application form to NMDC on or before 12-02-2018 along with supporting documents. Last date for applying online is 12-02-2018.